Of course I had to go and bastardize a perfect Italian dish. But how else would I celebrate the fact that at the very moment you’re reading this I’ll be arriving in Florence and heading up to the beautiful villa that we’ll be calling our home for the next five days? To me, there’s no better way to kick off our Italian vacation. 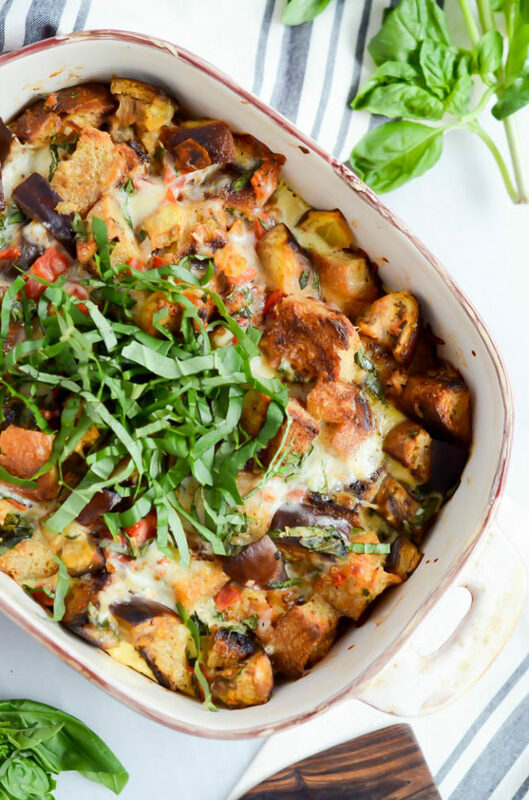 And let me tell you, this Eggplant Parmesan Bread Pudding is so delicious that you won’t even mind that it strays quite a bit from the traditional dish. 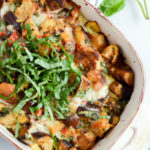 In fact, there really aren’t any similar techniques between the two, I simply took all of the ingredients you’d use for Eggplant Parmesan and, instead of drenching the eggplant in breadcrumbs, I decided to nestle it in huge chunks of crusty bread along with the other typical ingredients you use like tomatoes, basil and, of course, mozzarella cheese! But can we talk a minute about where I am right now and where I’ll be going over the next week and a half? Because I’m desperately looking for the best places to eat, shop and sightsee during our trip. We’re spending our first five days in Tuscany, hopping around quite a bit to places like Florence, Montepulciano and Greve in Chianti. After that, we’ll take the train out to Venice and spend another few days there before flying home. I’ve been to all of these places before and have found a few hidden gems, but I’m always looking for more, so please, please, please send any suggestions my way if you have them. It’s my in-laws’ and hubby’s first time to Italy so naturally I want to show them THE most amazing time. Oh yea, that’s right. This trip isn’t just the hubs and I. We’re dragging along BOTH of our parents and my aunt. My aunt and I took a similar trip (staying at the same villa in Tuscany) a few years ago, and I’ve wanted to take the parents back ever since. Fun fact: Chris and I even talked about eloping and getting married at this very villa! In the end, we couldn’t bring ourselves to exclude some of our nearest and dearest (which we would inevitably have to do with an international wedding) so you can imagine how excited I am to bring everyone that’s so special to me to this very special place. 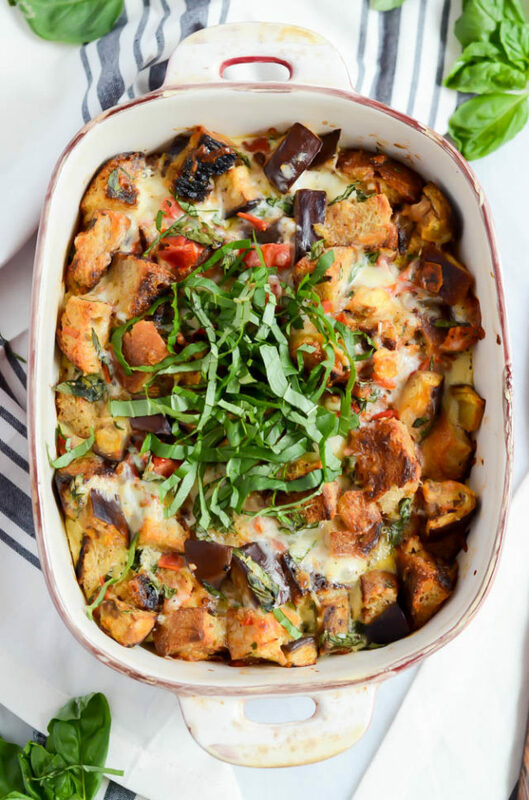 Anywho, let’s get back to this Eggplant Parmesan Bread Pudding because I clearly have more exciting things to be doing (ahem, packing) then slaving over the computer all day. 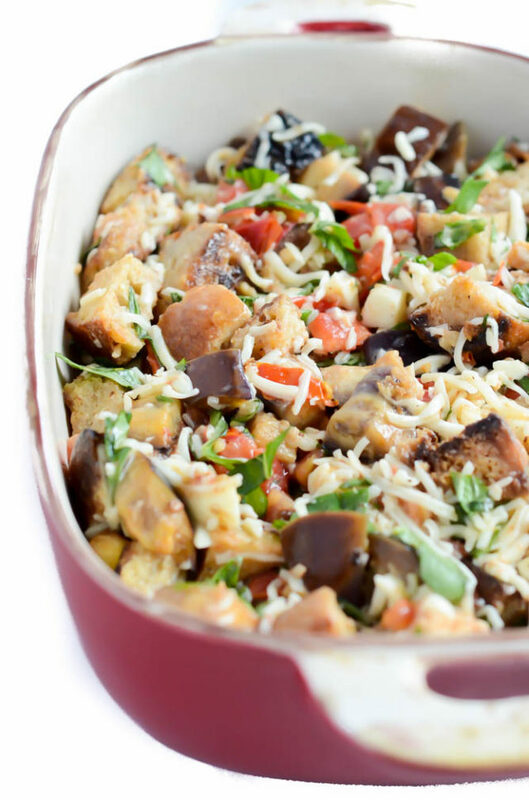 I love this recipe because there are only about 20 minutes of hands-on prep, and then you just throw it in the oven and 30-ish minutes later you have a well-rounded meal (we’re talking veggies, cheese and bread) ready to just plop down on the table and serve with a huge side salad. I’m definitely speaking from experience and let me tell you, the salad is a must. It’s the perfect complement to such a filling yet tasty dish and, hey, balance! 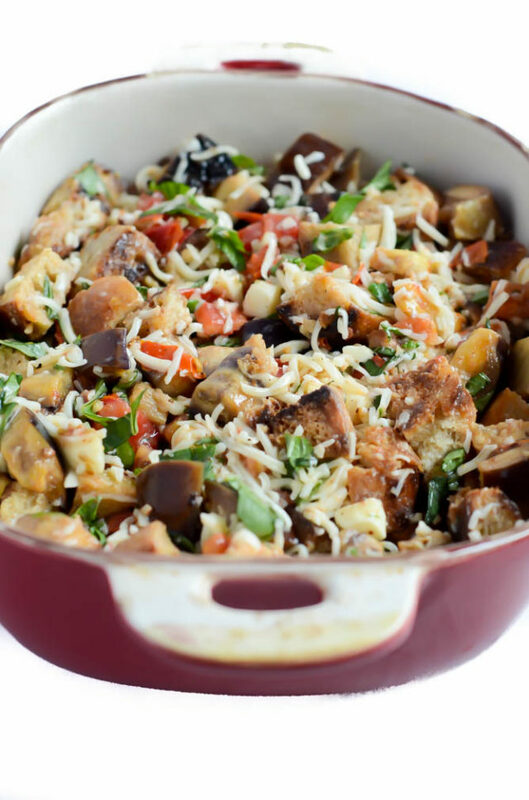 So the only prep you have to do is toast the breadcrumbs (which BTW you can also do up to a day in advance), give the eggplant and garlic a little saute and mix all of the “pudding” ingredients together in a big bowl before dumping it into your baking dish. That’s seriously it. Let me tell ya, it can’t get much easier! Straight out of the oven -> Onto the table -> Into the mouth. That’s my ideal dinner if I’ve ever heard of one. Now excuse me while I undoubtedly go gorge myself on all of the delicious Italian food and drink I can find for dinner. 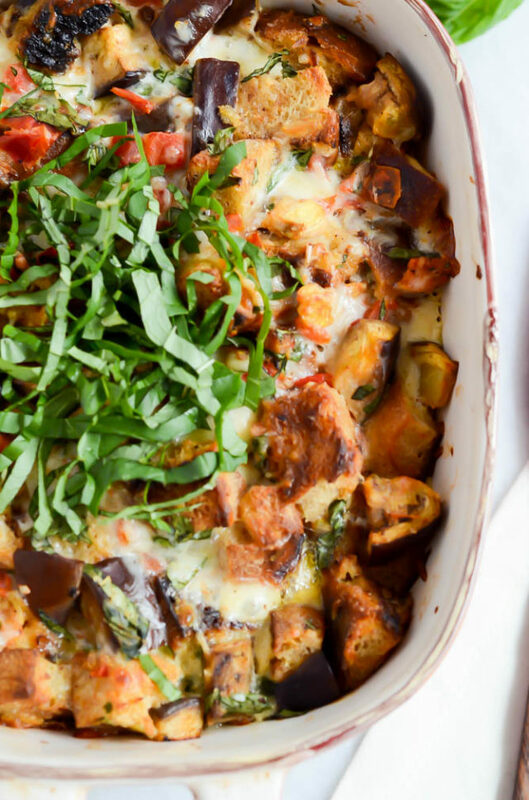 You know you want to make this Eggplant Parmesan Bread Pudding tonight and eat along with me in spirit!